Sliding doors are great because they are both functional and aesthetic. The right sliding door will improve the appeal of your home instantly. Unfortunately, they do not give your home the security it needs. Even if you choose to use a sliding door as a back door, you still need to secure it. The following are some tips to secure any sliding door. A security camera makes it possible to monitor movements at the door. It allows you to see if an unauthorised person attempts to get into your home. Most burglars will stay away from a door with a security camera. 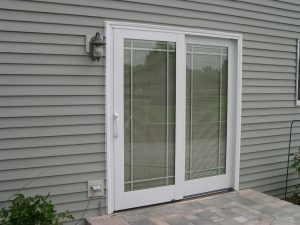 A slide locking bar is a thick bar that is designed to fit at the bottom track of your sliding door. When you fit it into the track whenever you lock the door, it is impossible for an intruder to get in. If your sliding door has a lock on the side, you need to ensure that it is in good working condition. If the lock does not work, the security of your home may be compromised. Test it regularly to ensure that it stays in good working condition. The lock is the primary security feature. If the latch is faulty, get professional locksmith services. Your sliding doors allow people to see into your home. Use blinds and curtains for privacy. They keep people from seeing what is inside your home and possibly coming back to steal from you. If nothing seems to work and you feel that your home is not secure, consider replacing your door. Trade it for a sliding door that fits well. You may also replace the frame of the door to get a tighter fit. Do not get stuck whenever you need help to secure your sliding door. We specialise in locksmithing and are devoted to ensure that you do not feel unsafe just because your door was not properly fixed when it comes to locks. We train our professionals regularly to ensure they are up to date with the changing trends in home security. CPPM is a locksmith in Headington, Abington, Oxford, and the surrounding areas. We have a team of certified and experienced agents who will help you repair your old or broken locks. We give you fair quotes and no hidden charges. Our locksmith services are available 24/7 and our work is approved by insurance companies. Next Next post: Can A Locksmith Make Keys From Locks?